Welcome to the RMCA's home on the web; we hope you enjoy your visit! Millions of domestic and wild animals have been harmed by Hurricane Katrina, but the good news is that several animal welfare and rescue organizations are already on the ground saving lives. The organizations listed below are professionals with extensive experience in disaster areas (and they always need donations!). In addition, if you live in Texas and have spare room for stranded domestic rats or mice, please contact Eadie's House immediately. Keep in mind proper quarantine procedures, and please remember these animals may not be in the best of health after their ordeal. Emergency Animal Rescue Service (EARS) - the oldest animal disaster rescue organization in the United States. Noah's Wish - founded by the original director of EARS, Terri Crisp. International Fund for Animal Welfare (IFAW) - helping to underwrite EARS operations. The American Society for the Prevention of Cruelty to Animals (ASPCA) - founded in 1866, the oldest, and first, American animal welfare organization. We love our small friends--we value their lives. We will not knowingly sell, or allow them to be used as food for other animals. We understand their value goes far beyond the dollar. We will meet all of their needs. We will breed with care, being responsible to limit their numbers, spending the time required to achieve the best pets possible. We realize that some "Show Quality" animals will result. This is a by-product rather than a goal. In this way the rats don't pay with their lives for our ribbons. 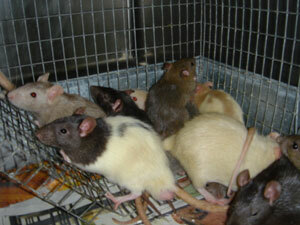 RMCA is a club for domestic rat and mouse lovers. Although we love wild rodents, we have very little knowledge of them. If you have found a litter of wild rats or mice and wish to care for them until they can be released back into the wild, please read the article "Caring for Orphaned Baby Rats and Mice." Wild Rodents! Your pets need a home, too. Don’t abandon them when you leave yours. Be sure to visit the Rat Guide, A Layman's Guide to Health, Medication Use, and Responsible Care of Pet Rats. This site was created in association with the RMCA and our Florida chapter. Our users have posted a total of articles. The newest registered user is .